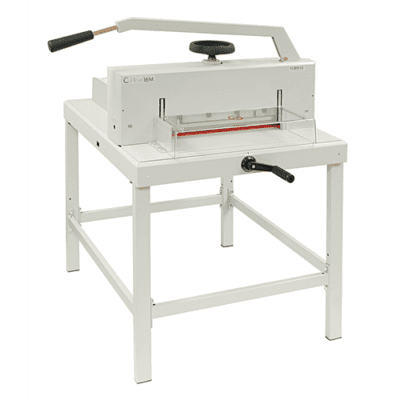 The Cut-True 16M Manual Paper Cutter combines accuracy with ease-of-use in cutting paper up to 18.7” wide. 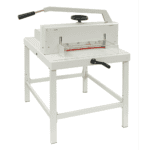 With its hardened-steel Guillotine blade, and lever-activated blade arm, it has the capacity to cut through paper stacks up to 3.15” with razor-sharp precision. Using the LED Laser Line, spindle-guided back gauge and calibrated scales, operators can make fine adjustments, and know exactly where to cut. In addition to accuracy, the Cut-True 16M ranks high in safety features including front and rear transparent covers, blade lock, external blade depth adjustment, easy blade change access from the front of the cutter, and a wooden paper push for safe alignment. It also includes a rugged metal stand for a comfortable working height, and feet for tabletop use. The Cut-True 16M is ideal for transforming brochures, invitations and more, with crisp, professional cutting, and makes a great addition to print shops and in-plant finishing. Key FeaturesQuick and accurate. Cuts stacks up to 3.15" H. LED cutting line. Various safety features.